Welcome to www.shebbearvillage.co.uk, the community website for the parishes of Shebbear and Buckland Filleigh. This is an independent one stop website aimed as a resource for locals and visitors alike. If you are looking for accommodation, a tradesman, loaf of bread, social events or just background information, you can find it all here. Do have a browse through the pages. The website is still being developed, if you don't find what you are looking for, then please Contact us to ask or make a suggestion. If you contact somebody through the pages of the Shebbear and Buckland Filleigh website, please tell them where you got their details from. The website for Shebbear & Buckland Filleigh is not the only local website available to our community. Click here to view full details of the latest vacancies in Shebbear. 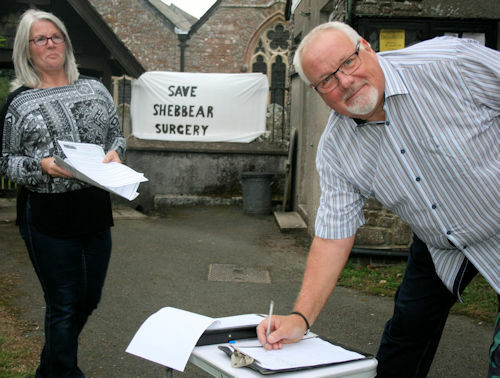 In 2018 Shebbear has been denied a resident GP for the first time since 1890. Join the campaign to demand that NHS England force Ruby Country Medical Group (RCMG) to provide our community with an effective GP service it deserves. We expect our NHS to put patient care before private profit. This is not a criticism of the any health care provided or the staff involved, just a concern that the surgery won't return to Shebbear if no pressure is brought to bear. Amanda Fisk, director of assurance and delivery at NHS England, said: “We’re really pleased to award the contract to Holsworthy Doctors. Their submission was impressive, especially its focus on the needs of patients and the quality of service"
It was discovered that the surgery will close a month earlier than planned with less than 24hrs notice. Ruby Country Medical Group told patients that Shebbear Village Hall will be used and what times, despite the fact that they hadn't inspected the hall or contacted those responsible for letting it to see if it was available or had a phone of Wi-Fi. Eventually, after much speculation on social media the first public announcement was not released directly but through the Village Hall chair about ongoing surgery plans from 2nd July onwards. This still had timings that couldn't be adhered to due to previous Village Hall bookings. No mention was made of prescriptions which were previously denied to patients. Despite the booking of the Village Hall hasty site visits to The Church Hall and the Village Hall were made on Sunday 1st to see the sites to make a final decision. The Village Hall was chosen and the surgery times corrected. Jane Wells Managing Partner of RCMG addresses the Shebbear Parish Council meeting. Below is the relevant part of Shebbear Parish Council Minutes. 51a. Chairman welcomed to the meeting Jane Wells, Managing Partner, Ruby Country Medical Group. "The General Practice is managed by CQC, and when Dr Fernandez decided to end his contract we put in a bid against two other parties, Ruby was successful and invited to take over the contract on 4th August to cover Shebbear and Hatherleigh. This was subsequently moved forward to 1st July. Unfortunately, there was a hic-cup with the 'take-over' and we had to roll out contingency plans. We are looking to identify long term premises in both Shebbear and Hatherleigh. Ruby is absolutely committed to provide a GP presence in Shebbear equal to what we had been used to have as a local service, with a view of having a permanent location for the practice in Shebbear within about 3 months. Meanwhile, NHS England is providing a bus to run from the village to the practice in Holsworthy". Jane did reassure the meeting about future services here, to the extent that there would be two doctors at least, one male and one female, on alternate days possibly, giving five days cover here. Prescriptions would be issued here and could be dispensed in Holsworthy for the present, and medicines delivered to the village hall for patients to collect. She asked that the Parish Council would encourage patients to collect their medications on the allocated day as no meds could be stored at the hall. Councillors addressed questions via the Chair and Cllr Clark asked about the cost of unused medications in Beech House and the cost of disposal. Jane Wells said it was no cost to the NHS or to Ruby as it was all the property of Dr Fernandez and the loss and the cost of disposal would fall to his account. Cllr Clark asked if Jane Wells felt there could be a 'rapprochement' with Dr Fernandez to which she replied 'no chance'. Chairman thanked Jane Wells for her attendance and explanation. The Surgery at the Village Hall finishes for the day, a note was placed in the window and doors were left open over night as they left. Nobody was contacted until a statement was made the following day by NHS England. NHS England letter released by Mark Proctor blaming Dr Fernandez for not being able to secure Beech House and unspecified problems with Hatherleigh premises and Shebbear Village Hall. Strangely these happened at exactly the same time within an hour or so of each other. Q. How long will the mini bus to RCMG run? What are the plans for prescriptions? It was revealed that a Shebbear resident had negotiated with Dr Fernandez to act as intermediary to ensure that Beech House can once again be used as our surgery. This was rejected out of hand by Dr Brown of Ruby Country Medical Group and said that there was no timescale to replace Beech House. Still claiming that Dr Fernandez prevented them from using Beech House. Dr Fernandez has told residents of Shebbear that he is very keen on Beech House to be continued to be used for the new GP Practice. It is reported that Dr Brown and Jane Wells of RCMG have both said that they won't deal with Dr Fernandez. Ruby Country Medical Group continues to explore options for securing suitable premises in Shebbear. Preliminary landlord discussions have been held. This will always be a delicate process, but the practice is doing all it can to bring GP care back to the village as soon as it can. A GP practice that wants to dispense medications itself – rather than via a pharmacy – has to get approval from NHS England. This requires a formal application, in line with national regulations. Ruby Country is seeking dispensing rights for its patients in the Hatherleigh and Shebbear areas. An application has to be based in part on demand from patients, which the practice is collating." It is believed that there is already a dispensing license for Beech House, so why will they not consider it? This is also the first time that RCMG tell most patients who their appointed GP is, a month after they should have according to their contract and indeed the law. Jane Wells turns down an invitation to meet patients at a public meeting with a date to suit her. RCMG release the following information: "Premises in Shebbear Ruby Country Medical Group continues to explore options for securing suitable premises in Shebbear. Preliminary landlord discussions have been held. This will always be a delicate process, but the practice is doing all it can to bring GP care back to the village as soon as it can. Local collection of prescriptions A GP practice that wants to dispense medications itself - rather than via a pharmacy - has to get approval from NHS England. This requires a formal application, in line with national regulations. Ruby Country is seeking dispensing rights for its patients in the Hatherleigh and Shebbear areas. An application has to be based in part on demand from patients, which the practice is collating. There was/is already a dispensing licence for Beech House, so why will they not consider it? Reports from Holsworthy social media that RCMG appointments for Holsworthy residents are in the region of three weeks, even for very serious conditions that require much speedier attention, although Hatherleigh and Shebbear patients report little wait to get an appointment. A statement is read out at the Shebbear Parish Council meeting saying that RCMG will not attend a PC meeting that is open to the public. The reason given is that residents are getting upset on social media. A statement supplied by Dr Fernandez said that he had signed the Licence to Occupy and the Wednesday before the premises were due to be handed over, he received an email to say that RCMG had withdrawn from the agreement and won't be proceeding. There was no reason given. Dr Fernandez insists that it makes no sense for him to block the use of Beech House of Hatherleigh and is happy for the premises to continue to be used for their original purpose. The RCMG and NHS England have stopped answering questions. Freedom of Information requests have been made and we await them being forced to answer to the community of Shebbear. It is perfectly understandable if you feel that you need to move to a different surgery, but please put off the time as long as possible and complain to the CQC explaining the reasons why you had to. It may also a good idea to tell RCMG that you can't get to Holsworthy for prescriptions if asked. The RCMG met with a sub group of Shebbear Parish Council and a couple of Shebbear residents. Minutes can be found here. BUS FROM SHEBBEAR We know that there has been some concerns that the bus from Shebbear to Holsworthy practice stopped yesterday. However the driver got it wrong, the bus from Hatherleigh has stopped but it will continue from Shebbear. Apologies for the confusion. I would like people to understand that the bus driver did not get it wrong. The service contract was to end on Friday and no one saw fit to inform either Hatherliegh or Shebbear patients. I was shocked at this and informed Holsworthy Medical centre that their patients did not know there was no longer any transport. The company I work for then got a phone call late Friday aftrrnoon asking if we could do a new service but from Shebear only. If I had said nothing to anyone then Holsworthy would not of realised they were letting people down. Times of service are the same. It's vital that every patient and resident plays their part and raises their concerns with those who might make a difference. Please do not harass the doctors, nurses HCAs or receptionists of Holsworthy or those of the closed Shebbear Surgery. Be sure to raise the points that are specific to you, how long is the mini bus going to be available, when will medication once again be dispensed in Shebbear, what are the issues preventing the use of Beech House Surgery?